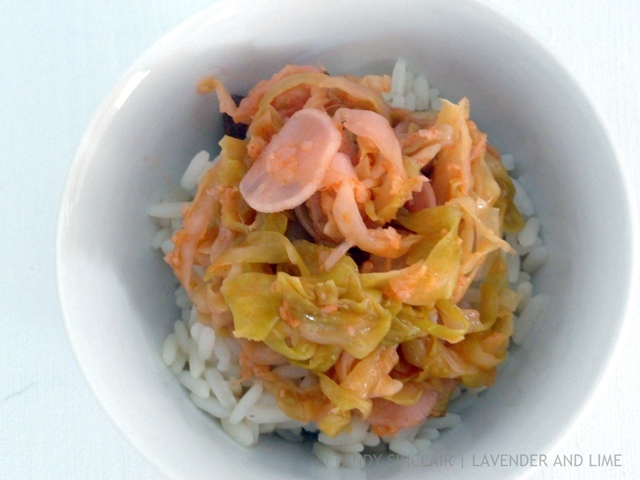 Kimchi is a traditional Korean dish made from fermented vegetables. For my version I have used cabbage, radishes and spring onions. You can adjust the seasoning by using a milder form of Sriracha. Have you ever been invited over for dinner somewhere and the food is served platter style? And you are asked to please not finish what is being put on the table. The hostess lets you know that she wants to save some of the protein for two other meals. So you look around at the side dishes and realize that they are not really to your taste. You end up eating a smaller portion of the meat, chicken or fish and pick out the bits of the side dishes you enjoy. And leave the dinner table feeling hungry. Well, this has happened to us so I have learnt a good way to manage the request. I take an interesting salad with us when we go out for dinner. Only when the likelihood is we will be asked to leave leftovers. 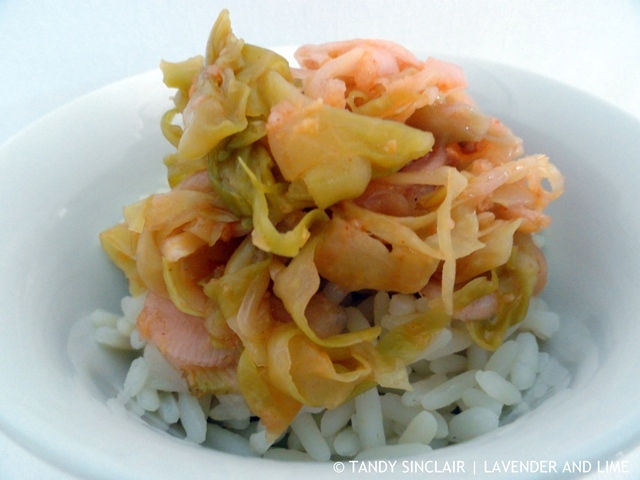 Last week I made some fluffy rice to use to photograph my kimchi. Not wanting to waste the rice I turned it into a salad. I was not sure how this would go down. The kimchi has quite a distinct flavour. And to make sure it was not too overpowering I did not put too much in the salad. Everyone loved it which was quite pleasing. I am going to make a stir fry next to use up more of this hot kimchi. What a odd request. Surely if you don’t want all the food eaten, you just don’t put it out on the platter. And, unless it’s a whole oxen, it seems a bit mean to tell people to only eat a little. Isn’t hosting a meal about generosity? Anyway – I love kim chi and like your take on it. I love the term generosity and I can see a whole blog post coming about that! I love this version of kimchi. This will be on my list to make. Hi Tandy, yikes, thank goodness that has not happened to us I don’t know what I would say. Beautiful kimchi!!! It is an ongoing problem sadly! 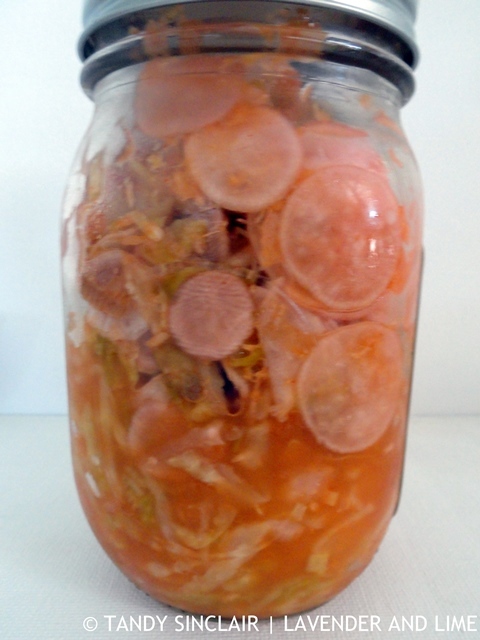 Gosh fermented Kimchi ahs been on my bucket list, yumm. Yeah what a rude thing to do not allow people to eat the food they have in front of them liek that. just take out ahead of time what you want to keep at least! We are definitely making this. My husband loves it and I haven’t found the right ingredients yet. Didn’t think about sriracha but that may do it! Yum! I’ve always wanted to try making Kimchi at home. It’s sooo good! I love kimchi and yours sounds delicious. I’ve not made my own before! Hehe Tandy I’m so confused by the hostess’s request. Why would she want to save it? To eat at another time? Um. Why would someone put food on the table if it’s not meant to be eaten. Strangest thing I’ve heard.